The dead rose. They rose in bloody tatters, missing limbs, arms, eyes; the rich integuments of flesh that made them human were gone, but they rose. And they looked at Ingram with hateful eyes. So begins one of my favorite sections of the novel Southern Gods by John Hornor Jacobs ($14.99, Night Shade Books). 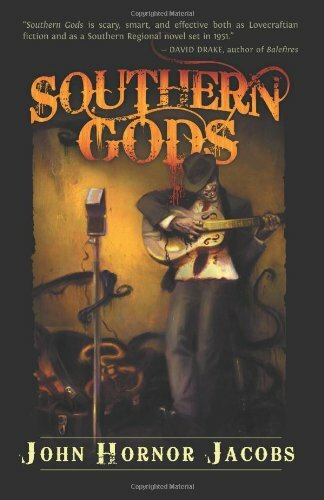 One of the finest horror novels I’ve read in the last ten years, Southern Gods is the tale of a WW II veteran working as muscle-for-hire in Memphis in the early 1950’s. Sent on a mission that takes him into the remote backwoods of Arkansas, this protagonist soon finds himself absorbed by an otherworldly quest to find a Robert Johnson-style bluesman (whose music may have supernatural powers) named Ramblin’ John Hastur. Lovecraft is a difficult writer to imitate or follow. Evoking a Lovecraftian tone is a little like trying to copy a dish by a master chef, but you don’t have the recipe and even the slightest miscalculation makes the entire souffle fall flat. Jacobs succeeds. Further, he finds the best kind of success– that I tend to notice in books by King and Campbell and Straub– wherein the writer’s personal style muddles with Lovecraft to create something new and wonderful. Southern Gods is new and wonderful. Southern Gods transforms rural Arkansas into a labyrinth of tantalizing dangers and mysteries. There’s an uncanny tension that mounts on nearly every page. (And “uncanny” is really the right word; so many familiar and friendly things are rendered alien and frightening by the time Jacobs is done with them.) It isn’t like the cheap tension in an airport thriller. Instead, it’s the sensation of being dragged deeper and deeper into a dark malaise where you know it will almost certainly have to get worse before it gets better. Thus, while Southern Gods may not be the finest “zombie novel” I’ve ever read, it is definitely the finest “novel with zombies in it” that I’ve ever read (if you follow my distinction). At the end of the day, it is far beyond my poor power to add or detract from an important creative achievement like Southern Gods. This book is exceptional, and you should pick it up. “Recommend” is far too weak a word. I loved this one too…great review! Great review! Some people just have the gift of buttery words. I will check this out! PS- if this doesn’t go unnoticed…could you add a ‘subscribe’ button, I would love to get updates on your reviews…for my own reading purposes!